Another year, another LocalGovCamp and, as ever, it re-affirmed knowledge that there are good people passionate about making public services better willing to get together on a weekend and think, share and do. 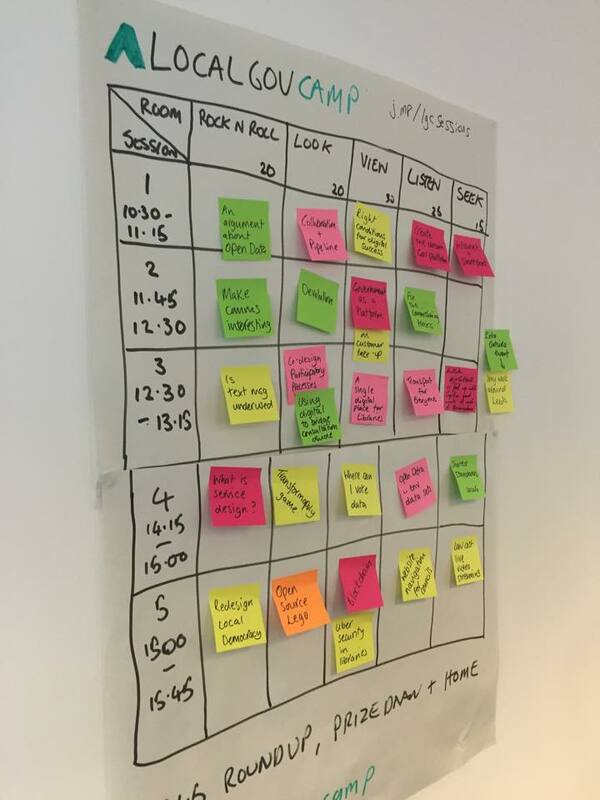 For the second year LocalGov Digital took on organisation of the event and following on from last year’s successful fringe format went with the Friday Makers and Leaders / Saturday Unconference line-up. Unlike last year I didn’t do huge amounts of the organising but handed over to a local team after gathering the sponsorship and setting the date. Some thanks to those that did take on organisation a little further down! As always LocalGovCamp has provoked my thinking, challenged some ideas and confirmed others, been full of conversation, been a fantastic opportunity to meet new people and catch up with those I’ve had the pleasure of knowing for a while. LocalGovCamp 2015 nearly didn’t happen. The words ‘Cancel it. JFDI’ were emailed. I’m really glad that a way was found and the event went ahead. That it did is down to a few people who deserve huge thanks for taking on the task as my diary filled up – Nick Hill, Phil Rumens, Diane Sims and Eddie Coates-Madden. Of course it is also thanks to the sponsors. And to Dave Briggs for compere duties. Although among one of the easier types of event to organise the effort of creating an open space event shouldn’t be under-estimated or left under-praised. So thank you LocalGovCamp 2015 organisers, each and every one! I enjoyed being interviewed by Nigel Bishop and reflecting on what has changed between the first LocalGovCamp in 2009 and today. To begin with, everything. The sector is changing, politics and budgets are very different from six years ago. At that first one there was a lot of practical ‘how to’ type sessions whereas a lot more ‘shared thinking’ seems to happen now. The topics too have changed – back then it was all about the emerging social networks to a few years where it was all open data to now where sessions run on these and everything in, between and around. Other things never change – the corridor conversations are still the most surprising bit, you can never get to everything you want to and the very nature of open space events is empowering. LocalGovCamp is, and I hope always will be, an exhilarating, thought-provoking wonderment of possibilities. I hope it continues to evolve and be the event the sector needs and deserves, without losing the things that have made it that very thing for the last six years. I said the phrases ‘knowledge pollinator’ and ‘social engagement contagion’ and I’m only a little bit sorry. We were in a session about intranets and my question, as always, was ‘is an intranet the solution to the problem you’re trying to solve?’ The session was really thought provoking and lots of experience and thinking was shared. I loved that it didn’t get stuck on ‘what tech?’ but was a discussion about organisational maturity; the value of community management; and what a misleading and all-encompassing phrase ‘intranet’ is (document store, comms channel, gateway to systems, engagement tool and more). I drew a pyramid of needs on a flip chart. It isn’t so much a Maslow hierarchy but more showing how organisations can categorise incoming enquiries and filter them through the most appropriate channel for both the org and the customer. I’m pretty sure that I was inspired by something Bristol had done on this. It was part of a session that started out being about website navigation and again, spun off in a fantastic way to be about natural language, search, homepage design, user research and testing and challenging culture. I later exchanged a few tweets about ‘digital by design vs digital by default’ and whether one provided a more exact phrase about ‘choosing the right channel for the customer, service and organisation’ than the other. We didn’t really get to a conclusion but it was great to have some healthy, constructive debate online and off. I shared A LOT of stuff about what we are doing at Nottinghamshire. I hope other people found it interesting and useful. I found it useful to reflect on what we’ve done so far in Digital First and talk about what we intend still to come. I shared our beta site again – it’s here http://beta.nottinghamshire.gov.uk and in just over a week it will become the official website of the county council. We’ll always be in beta, making it live is a starting point, not the end – feedback is really welcomed! We’ve blogged bits of our journey here. There were some interesting online and offline discussions about whether council websites should carry advertising. We did a little user research on this at Notts and found a split between people who would be ok with ‘ethical’ (and we didn’t delve deeper to understand what this might mean or who would decide) advertising if it was making money to protect services, and those who felt they’d already paid into local government through council tax and therefore we shouldn’t be seeking additional revenue through ads (unless we would cut their tax as a result). While the income generation potential is attractive to councils in current budget situation the ethical question is important. As is (I think) understanding how ads fit into the user experience, and if they have a detrimental impact would you be gaining revenue in one hand but losing it in the other through people abandoning the digital channel for a more expensive (to the org) but ad-free one? LocalGovCamp reminds me how much I really like using my brain to think about this stuff and gives me time to reflect on my experiences of working in local government and digital. Today I was really grateful for the coaching (missed you today Carl!) I did this year and a bit more aware of where my own development might need to go next. And finally, and on a side note, I don’t think I would ever get bored of someone approaching me, holding out some music and saying ‘I heard you are a music writer – would you listen to this?’. I find that a huge privilege and compliment, and I can’t wait to listen to the CD I was given today! There are Google Docs’ here for all the sessions and people added notes throughout the day. Any blog posts and links to outputs will be added to the LocalGov Digital website at some point (probably). Follow @localgovcamp for news about LocalGovCamp 2016 and get involved in LocalGov Digital – a grassroots movement of those in and around local government who as passionate and proactive about making public services better. There’ll be a Google Hangout soon if you’d like to join the discussion about getting involved and growing into our possibilities. Find me on Twitter – talk to me! I write about music for Louder Than War. I’m features editor on the website and an associate editor for the print version (issue one out 17 September – buy it in WH Smiths, independent newsagents or order online). My words about music are here. I also do music PR and promotion and occasionally share music-related things over at my little agency, Noble and Wild. You can also find us on Twitter and Facebook. And because so many people asked me about it today – yes, I’ve written a couple of novels this year and yes, my pen name is Riley Reynolds. You can catch up on where that is all at on my other blog or (you knows it) on Twitter. Posted in Events, local government, LocalGov Digtial, localgovcamp.Tagged local government, localgov digital, localgovcamp, localgovdigital, unconference.